Alla prima paintings are completed in one sitting. When I paint a portrait this way, I draw with my brush, minding the spacial relationships between features. Next, I lay in the darks using full color, to support the forms of the face. The midtones, the lights and their transitions blend into the previous wet passages to complete a loosely painted portrait. This one layer painting allows me to break from the confines of too much detail and preserves the energy captured at the very start of a painting. Interesting to see (and learn a little) your process for such an expressive portrait! Pleased you were interested! Many thanks, Robert. thank you! I love life seeing (and recital about) you’re originative process. Really impressive – love the looseness and the bumps and scrapes of life. It’s fun with the very wet paint and quick decisions. Give it a try! Fascinating to see the development of this painting – you really have kept the sense of a fleeting moment captured. Pleased you think so, Anna. Thank you! A little insight into your technique – knowing the process makes me appreciate the product even more. I’m glad. Thank you, Marie. The pleasure is mine. Thank you, Eddie Two Hawks. Exceptional. Wish I had a tenth of your talent. Thank you, John. I wish I could ponder and write like you do. Thanks for the info on alla prima painting. Always makes a piece more intersting knowing what goes on in the mind of the artist and your plan as you paint. Technique. Technique. You’ve got it down. I think children are more difficult to draw/paint. You have captured the moment. Great portrait. Thanks for sharing details of your process. 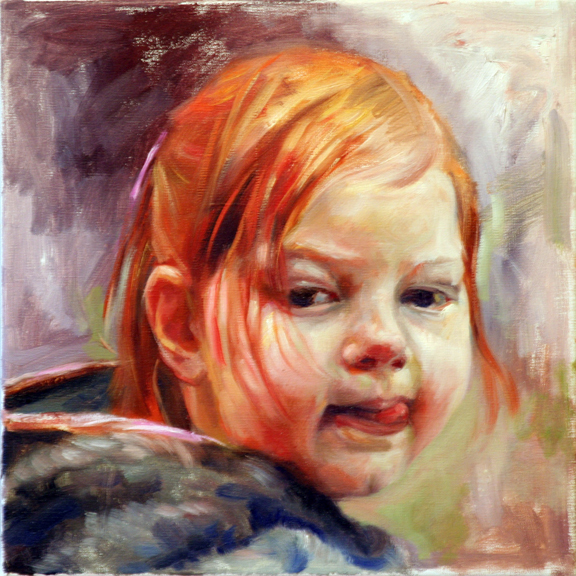 thank you too for sharing your process behind this beautiful lively portrait. My pleasure, Maria. Thank you! Yes, you are Leonardo’s student! I love how you capture facial expressions. Exquisite!